We went to Lollibop 2012 (read about it here) and had the most amazing day - I'm really hoping to go again and I'd fully recommend it to all my readers. This year, Lollibop has a new venue and the line up is even more exciting than last year, I can't wait to see my little ones faces when they see the Mr Men! 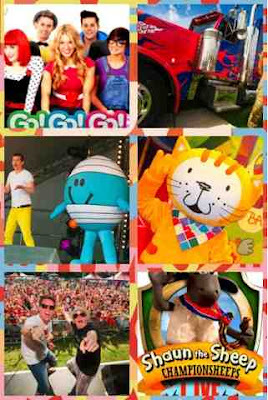 Poppy Cat was a big hit with my little boy last year but I think this year, Meg will be most excited as she's really become a fan in the last few months! Same for Cloud Babies! Blake would be very giddy with Shaun the Sheep performances and last year we didn't quite make Optimus Prime! There's so much to look forward to it would be an awesome day out! In my review last year, I'd said I'd like to do two days instead of one and this line up confirms that! Joining some of the hottest names in kids’ entertainment, as well as hundreds of activities, workshops and interactive demos, are the Mr. Men and Little Miss Village Green Event andShaun the Sheep’s Championsheeps LIVE! Run wild and have fun in the LolliSportsarea. With activities including retro favourites like swingball, hula-hoop and frisbee to football tournaments and sports day style races.